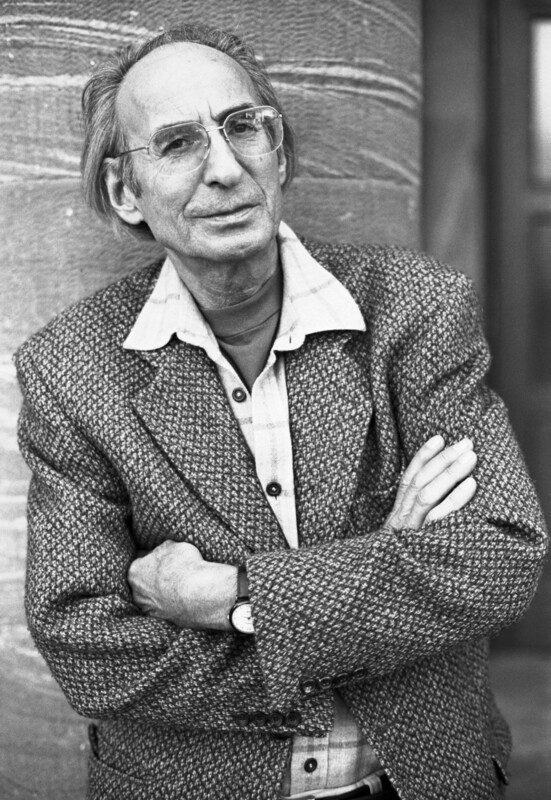 Peter Rühmkorf (1929-2008) was among the most influential postwar writers of his native Germany, winning every major literary prize for his prolific output of essays, poetry, plays, and prose. 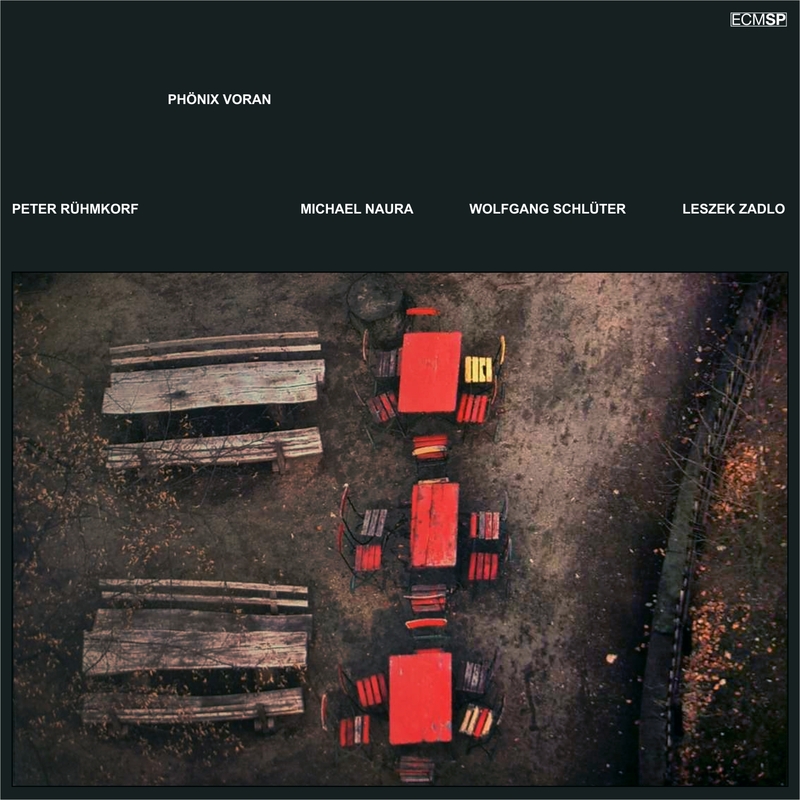 Yet despite having given spoken performances on stage with pianist Michael Naura and vibraphonist Wolfgang Schlüter for over three decades, his only appearances on record in such a configuration were captured via two rare ECM “SP” albums from the late seventies. I was beyond fortunate to be offered these two albums off the shelves while visiting label headquarters for the first time in Munich, and the die-hard fan will want to seek them out. 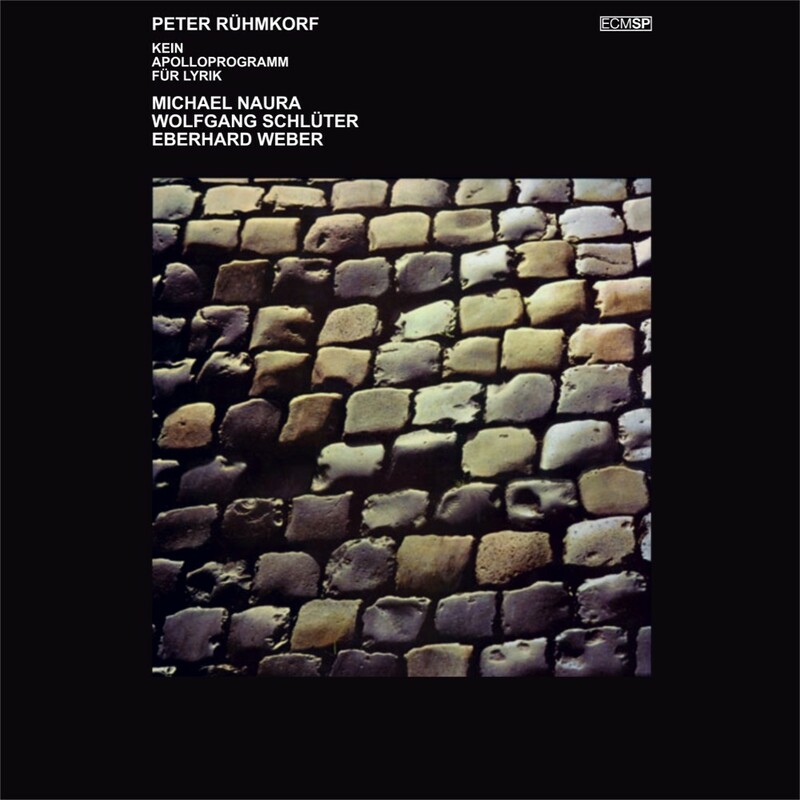 Going beyond mere sound structure or program music, Rühmkorf was rather looking for something harmonious between the spheres of language and sound production, and on these long-out-of-printers I think got rather close to that ideal. The title of this first long out-of-print relic translates to “No Apollo Program for Poetry,” and indicates Rühmkorf’s interest in going beyond mere sound structure or program music. Rather, he was looking for something harmonious between the spheres of language and sound production, and here I think he was approaching that ideal. Rühmkorf further professes a downright biological need for poetry and skirts, in his darkly effervescent way, the line between emancipation and integration. As with most of ECM’s speech acts, this one will be of little poetic use to those who don’t understand German. It should, however, be of immense value to the label’s fans for its musicianship. In addition to a rare early appearance by bassist Eberhard Weber (who also plays cello on one track), one is treated to some fine playing from Naura and Schlüter. Aside from two short tracks of Rühmkorf alone, the album is brimming with attractive makings of music. The trio activity of “Tagebuch” (Diary) establishes a grand, theatrical sort of precision with minimal means. Weber is robust and elastic as ever, sometimes climbing his way into the center and at others laying down club jazz atmospheres with Naura at the keys and playing us out on a bed of velvet. For the most part, the playing is so illustrative that translations are hardly needed. “Hochseil” (Tightrope), for instance, balances Rühmkorf on a lone marimba that also carves helixes of reverberant post-production, while Weber’s percussiveness in “Zirkus” (Circus) builds like the tension of a trapeze act. And, whether steeped in the balladry of “Meine Stelle Am Himmel” (My Point In The Sky) or gilded by the flanged cello of “Elegie,” the poet rides an arpeggio of new horizons, only to culminate in the deeper finality of “Komm Raus!” (Come Out!). Whereas on the previous album Rühmkorf stressed the importance of pathos with an air of resigned unrest, on Phönix Voran (Phoenix Preview) he chews the fat of inner strength in closer quarters. Adding to that claustrophobia—even as he installs a window view—is Polish musician Leszek Zadlo, who replaces Weber’s bass with saxophones and flute throughout, and to astonishingly cinematic effect. Rühmkorf’s ever-practical enunciation cracks open the piano and vibes like an egg, thereby releasing the soft yolk of Zadlo’s flute in a cradle of light and shadow. This combination, a sparkling one, works again on the freely improvised “Selbstportrait” (Self-portrait), which inhabits its own unsettled text with an increasingly kaleidoscopic gravidity. The flute lastly appears as Rühmkorf’s only partner in the aesthetically beat poetry-inflected “Allein Ist Nicht Genug” (Alone Is Not Enough). Elsewhere, the saxophone takes precedence of sound and space. The opening reed tones of “Auf Einen Alten Klang” (An Old Sound), pure and singing, find natural traction in the Naura/Schlüter nexus, then dance freely as Rühmkorf works his narrative labor into a material image. Zadlo and Naura share one duet in “Paradise Regained” for a vivid portrait of night. Yet the fullness of the project’s vision is best realized by the entire band. Highlights in this regard include the deliciously titled “Ich Butter Meinen Toast Von Beiden Seiten” (I Butter My Toast On Both Sides), a lovely track with the wherewithal to hold its prose like nourishment in the belly, and the sweeter onomatopoeia of “Impromptu.” And as finality lands again in the bustling farewell of “Tagelied,” we begin to realize that perhaps it is the voice that accompanies the music, not the other way around. While it might not always seem so in the thick of things, in hindsight the connections between speech and instruments are to be found not in meanings but in shapes. Naura’s music, which comprises the backbone of both sets, already has such a solid narrative arc that Rühmkorf is an intuitive fit to manifest its dips and climbs. Gems, these are. 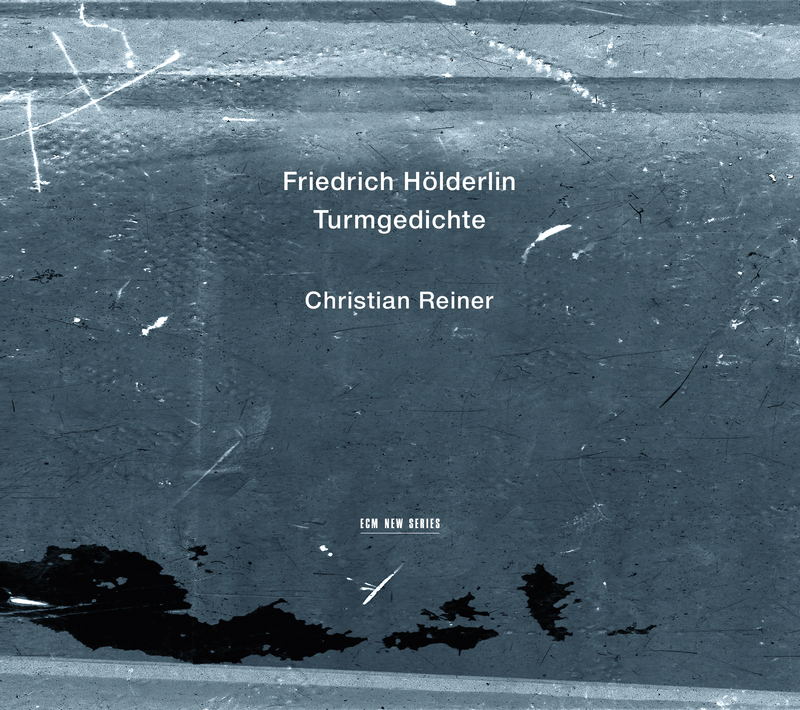 Vienna-based artist Christian Reiner reads from the so-called Turmgedichte, or “Tower Poems,” of Friedrich Hölderlin. 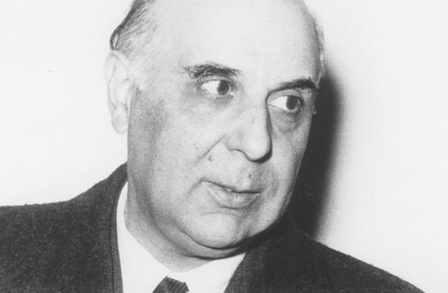 The German poet has, of course, long been lodged in ECM’s consciousness (see, for example, Scardanelli), though nowhere nearly as long as he was himself lodged in the selfsame tower, later known as the Hölderlinturm, in which he would spend the last 36 years of his life, until he fell like the pen from his hand in 1843. In his liner notes to this spoken word album, Peter Sloterdijk speaks of the tower as “an ur-scene of German culture,” and its looming presence and stonework are accordingly felt in every syllable crafted at Reiner’s lips. 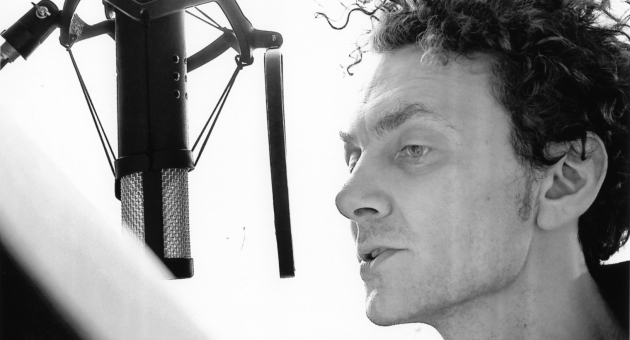 Reiner, whose work encompasses radio plays, theater productions, and other forms of experimental speech art, possesses a genuinely penetrating voice, but in the context of Hölderlin’s poems it is the voice that possesses him. The first word he speaks is followed by a pause so pregnant that we are drawn into the moment as eternity. Reiner thus allows us to inhabit the spaces of the words as if they were as architecturally significant as Hölderlin’s tower. We can feel the night pulsing through sentences, the poet’s mind closing in. The voice, then, becomes another soul, spun filament by filament until it speaks of its own accord. Aside from the signposts of the seasons, the word Mensch(en) is a major semantic touchstone of these texts. Its very sound looks beyond any flesh-bound meaning toward a dialectical non-being. It is not the man but the construction of the man, of the body as an instrument of love and lore, a book of pages bound by the circumscription of years and autobiographical anomalies. Before long, we feel that Hölderlin’s cosmology has become fraught with the weight of its own invention, and that every word is an attempt to burrow through its infrastructure in hopes that it will be hollow enough to float away at the puff of just…one…more…word. We also have the signoff of Hölderlin’s alter ego, Scardanelli, as well as the dates preceding their signature, to lead the way beyond landscapes of flesh contracting from the chill. And if we listen closely enough, we might hear the distant cries of cities whose populations tread the streets like spiders, their match-heads filled with mortal fear of friction. But even they cannot help but bump into each other, unleashing fires that wipe out entire boroughs, so that all we are left with in the end are friendship and love wandering like wild animals in a forest. Although I can’t imagine that Turmgedichte will be of appeal to anyone who doesn’t speak German, one may nonetheless link it to the readings of Heinz Holliger’s Scardanelli-Zyklus—only now we are exposed to the music of the language itself. In light of this, I would correct myself by distinguishing it from spoken word albums as instead an album of words that are spoken, for it is the act of their articulation that here matters most. The letters, of course, have organs, characteristics, and genetic idiosyncrasies, but in their sounding they are able to touch something grossly internal in all of us. Enormous, open in bed against one’s own. 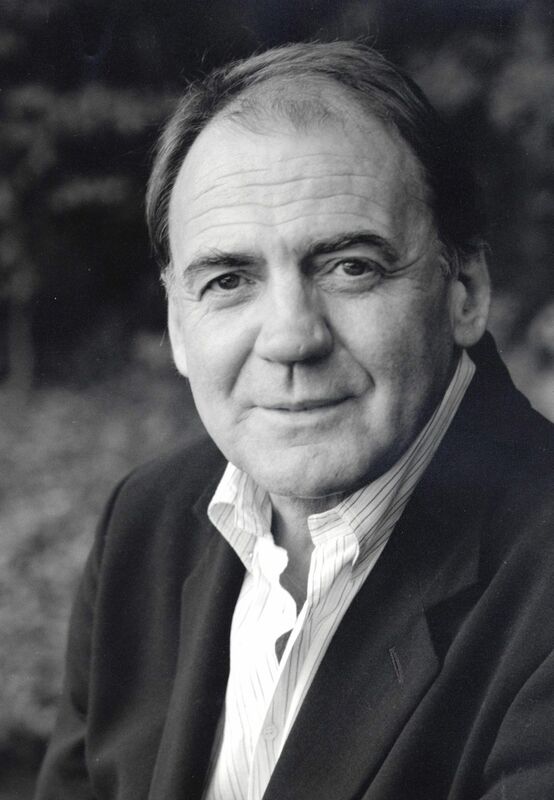 Swiss thespian Bruno Ganz will be familiar to any cinephile as angel Damiel, the veritable heartbeat of Wim Wenders’s 1987 classic Der Himmel über Berlin (a.k.a. 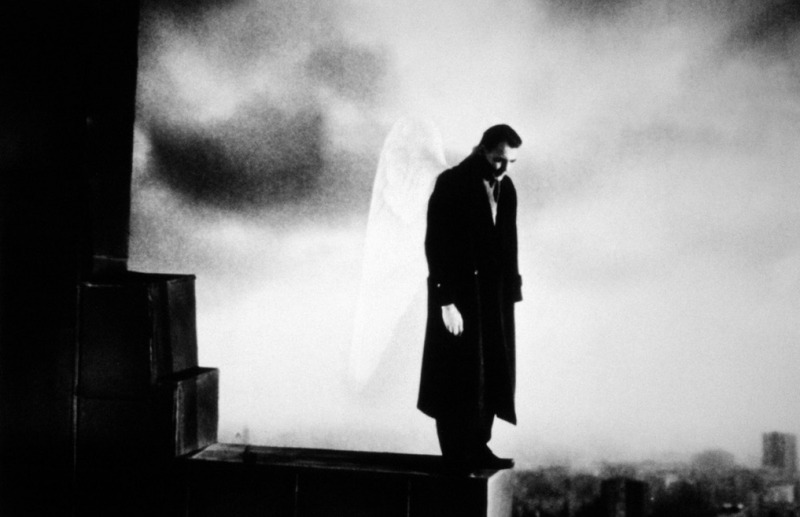 Wings of Desire), one of his many iconic turns on the silver screen. Field any admirer about his acting, and his voice is sure to come up in the conversation. Ganz speaks as he moves, carefully yet not without an honest revelation of frailty. ECM producer Manfred Eicher was already well aware of these vocal powers, and in 1984 and 1999 sought to strike them on a handful of poetic anvils to see where the sparks might fall. The results were two exemplary spoken word sessions which, though things of beauty, may alienate anyone without knowledge of the German language. It is a curious thing when this happens: a performer whose cinematic gifts are so easily shared through subtitles and international distribution, while his speech off screen is limited only to those who understand it sans technology. With no translations to hold our hands, we left to wander these worded landscapes alone. 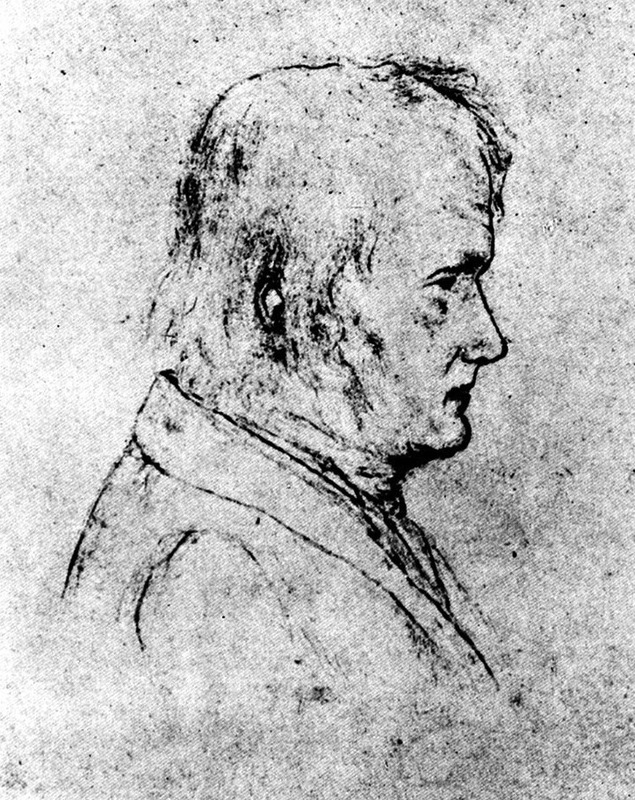 Ganz walks the fingers of his diction across the many bridges between bodies heavenly and earthly to be found in the writings of Friedrich Hölderlin. He begins between the Gemini and ends bearing a torch of proper time, scratching the sky like fingers of St. Elmo’s fire from the masts of those final utterances. May someone sense the forest’s cry. With its lovely meadows and pastoral shores. Even as he holds a sure ticket in his written life, a ticket that might take him anywhere, he would rather tear it into a thousand snowflakes and powder the craggy peaks of “Ihr sicher gebaueten Alpen” (“You solidly built Alps”). This fragment of stillness, this flicker of oneness with Nature, is no more than the shadow of an avalanche deflected by a palette knife. Cooked and sampled on earth. among flowers I learned to love. This, like many, was or grew out of, a fragment, the spore of a grander evening song that sprouted wings but chose to walk instead. In it thrives the search for purity where there can be none, except through the letters that shape its concept. Yet Hölderlin has no place on the battlefield of sign and message. The poet’s cause is by definition laced with deception, for the one who utters it cannot remain on the page. Hölderlin’s is a world of meditation, where the vagaries of the flesh are quashed by the beauty thereof; a place of cosmic pulses and tears of starlight. In closing, René Char’s Prometheus brings the sun to earth, laying it in the veined hands of Paul Celan, whose varicose words react like leaves on a dead tree—which is to say they sing for as long as they fall. The title here means “If there were water,” and buries us alive in “The Waste Land” before we even delve into the album proper. The booklet is far more informative this time around, and in a beautifully realized essay Steve Lake threads the spatial and temporal divide between T. S. Eliot’s masterwork and the poetry of fellow Nobel Prize laureate Giorgos Seferis. Through an intimate awareness of these texts and sounds, he notes, we are bound to neither. While Ganz was working on the set of Theo Angelopoulos’s Eternity and a Day, the Greek auteur handed him a volume of Seferis’s poetry. Enthralled, he responded to Eicher’s gentle nudges to record this follow-up session. 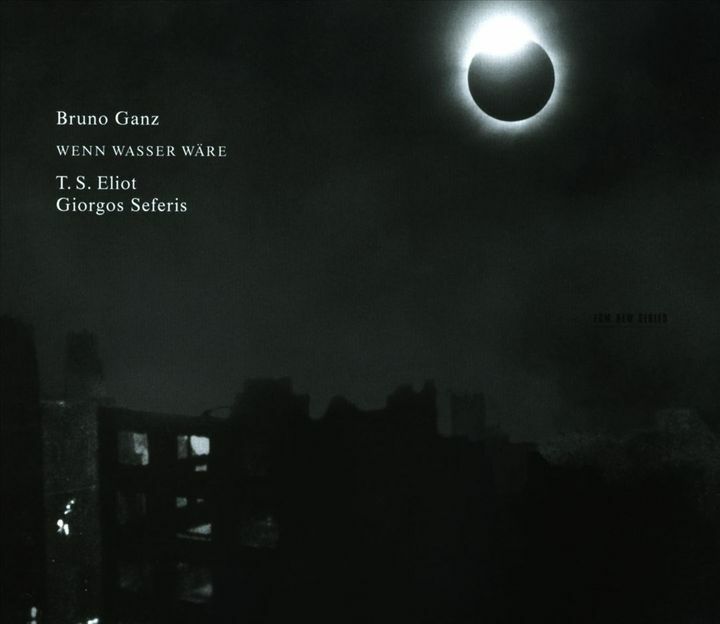 This time, selections from composers György Kurtág, Giya Kancheli, and Nikos Xydakis shuffle the deck of his recitation into an even darker eclipse. to drink water and to sleep. and unfolds a boundless calm. Gone is the majesty of sunset, the strangers’ footprints in the sand. In their place, a shoreline of broken chairs and ammunition: a sister landscape to Eliot’s. as he moves to cross the invisible fields. the way the cicadas suddenly, all together, fall silent. 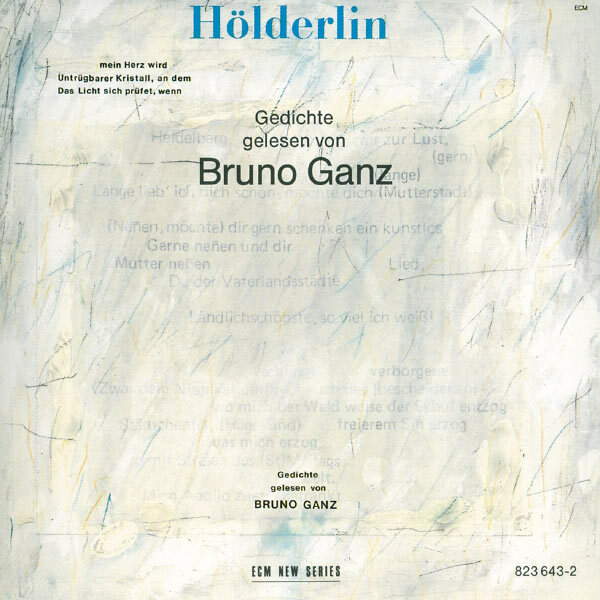 Not unlike the words he reads, Ganz is the feather-light sledgehammer of pathos. He crushes without hiding, hides without running. At his lips the word is holy because it communicates without image. It is the tightening of a chest when joy and fear alike reveal themselves to be as far from language as one can get. It rains from the sky in music, and tells us who we are. That takes and gives memory.